When they need to create quality engine components with a quick turnaround and tight tolerances, more and more manufacturers are turning to a new player in the field of manufacturing: 3D metal printing. 3D-printed blisk. The piece is made using a metal powder that is layered on top of itself. The excess powder is then used to create additional layers, which helps to reduce material waste in manufacturing. 3D metal printing is being used to create aircraft engine parts, fiber fan blades, fuel nozzles, and in 2015 NASA printed the first full-scale copper engine component for future use in space. 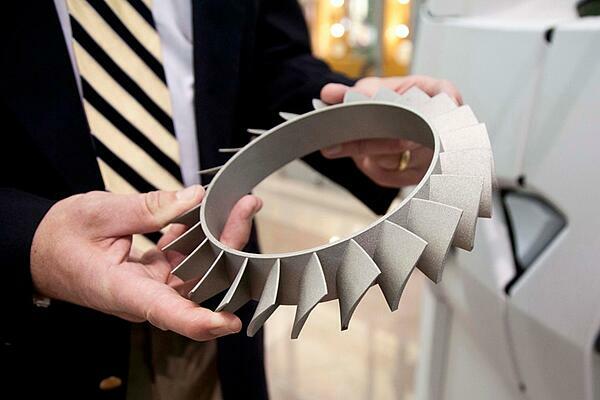 Whether 3D metal printing will become the way most manufacturing is done is only a matter of time. The question is: will you and your team be prepared to integrate this 3D metal printing in an efficient, comprehensive, ROI-savvy manner? Read on to learn about the benefits and drawbacks of various types of 3D metal printing, the most likely integrations, and the important role post-processing with abrasive products plays in quality control. The real utility of 3D printing for the manufacturing industry didn’t become apparent until the early to mid-1990s with the emergence of Selective Laser Sintering (SLS), or the heating of powder thru lasers to fuse the particles together without ever melting them. This coincided with the proliferation of CAD tools allowing high production speed with computer-assisted precision, and the rest is manufacturing history. Traditional casting requires a mold to be created in order to build even just one prototype. 3D printing is eliminating the need for molds by giving manufactures the ability to print one or multiple parts digitally. Early printing: The process was slow, tedious and not suited for high-production needs with tight tolerances like jet engine components. Early printer models lacked a cooling component for the heated metal, and parts needed a high level of post-processing. Future possibilities: In this Technotopia podcast, Greg Mark founder of Markforged, talks about his discoveries of microwaving metal 3D printed parts, creating stronger components. Mark also discusses the possibility of 3D printing surpassing cast part manufacturing, noting similarities to the 2D printing offset/digital changeover. He also predicts the end of the need to package and ship metal parts. Instead of a company purchasing a part or having it manufactured, the company could purchase the drawing and the part will simply be created by a printer at the company’s location. Currently the two main types of laser-based 3D metal printing for the modern manufacturing era are Selective Laser Melting (SLM) and Direct Metal Laser Sintering (DMLS). Current models are a far cry from the early prototypes of 3D metal printing and are set to grow exponentially with future innovations and applications. [Widespread use of 3D metal printing] would give designers more freedom, allowing them to create and test parts and devices with complex shapes that can’t be made easily with any other production method—say, an intricate aluminum lattice or a metal object with internal cavities. It could eventually enable engineers and materials scientists to create parts with new functions and properties by depositing various combinations of materials—for example, printing out a magnetic metal next to a nonmagnetic one. Lincoln Electric’s Wolf Robotics team showed off R-BAAM (Robotic Big Area Additive Manufacturing) at FabTech 2016. This inventive machine features both a laser powder and a laser hotwire process, producing larger components than bed-build options. This kind of large-scale manufacturing is still working out kinks, one of which is the need for post-processing to finish the product. Parts created by additive manufacturing are produced layer by layer instead of standard subtractive manufacturing methods, such as CNC machining. In addition to using less material, 95-98% of leftover metal powder can be reused. 3D printing is getting more accurate, faster, and less expensive, but as of right now printed parts typically require post processing. Depending on the application, this might mean CNC machining or finishing with abrasives. Surface finish is often the issue. Rex-Cut has products that can help you reach your desired finish. For smooth edges, a mounted point or a type 1 wheel might be the answer. For surfaces, a quick change disc could give you the RA you need. In keeping with moving manufacturing forward, post-processing can be automated with robotic solutions. Rex-Cut Abrasives’ Smooth Touch Wheel which is often used on robots to finish products like engine components that require edges to be deburred without changing the part geometry. If you are having trouble with post processing, send our experts your application details and we will suggest finishing solutions. Stay tuned for the critical factors in successfully implementing 3D metal printing in your manufacturing process.